With net neutrality in the US about to end by April 2018, internet organisations around the world are banding together to keep the fight going. Reddit, as usual, is in the forefront of this initiative and some subreddits are now displaying large banners before showing users the submissions. The banner, shown below, urges users to join Operation #OneMoreVote, a day of action against the impending end of net neutrality. The subreddit KeepOurNetFree is leading the charge in this regard with the following message posted on it. “This past December, the FCC voted to kill net neutrality, letting internet providers like Verizon and Comcast impose new fees, throttle bandwidth, and censor online content. If this happens, subreddits like this one might not exist. We can still block the repeal using the Congressional Review Act (CRA), and we’re just one vote away from winning in the Senate and taking the fight to the House. That’s why today we’re joining Operation: #OneMoreVote, an Internet-wide day of action. 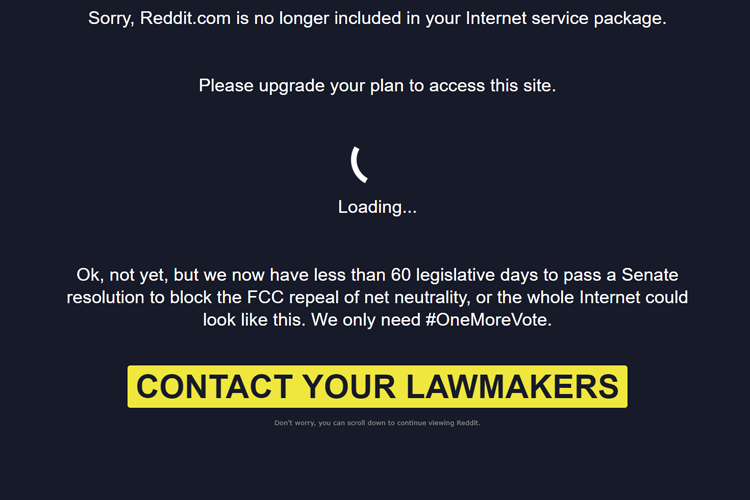 This affects every redditor as well as every Internet user, and we only have a 60 legislative days left to stop it. Please, take a moment of your time to join the protest by contacting your lawmakers. The team also released this video which details exactly what would go wrong once the new rules are in effect. As is evident the banner is using some scare tactics to get your attention, and given that end of net neutrality allows ISPs to act like gatekeepers for various websites, it’s not completely misplaced. The US Federal Communications Commission finalized the repealing of net neutrality and published the record in the Federal Register, an official dossier of government regulations, proposed rules, and public announcements. Following the publication, supporters of net neutrality will have 10 days to challenge the order in courts of law to be able to deter the repealing. The regulation, in the absence of litigation, will be implemented in 60 working days from the time of publishing i.e. by the end of April. While all of the 193 Democrats in the House of Representatives want to preserve net neutrality, they have just one Republican on their side. To be able to pass the resolution in the Senate, Democrats will need support from one more Republican, but that could be challenging. That’s where the #OneMoreVote campaign gets its name.